ACS (Access Control Services) is used to control which devices are allowed to communicate with one another, and thus avoid improper routing of packets. It is specially appropriate with ATS. Use of ACS to prevent many forms of silent data corruption by preventing PCI Express requests from being routed to a peer Endpoint incorrectly. As an example, if there is silent corruption of an address within a Request header within a PCI Express Switch (such as in an implementation of store-and-forward), the transaction may be routed to a downstream Endpoint or Root Port incorrectly and processed as if it were a valid transaction. This could create a number of problems which might not be detected by the associated application or service. ACS can be used to preclude PCI Express Requests from routing between Functions within a multi-function device, preventing data leakage. The use of ACS to validate that the Request transactions between two downstream components is allowed. This validation can occur within the intermediate components or within the RC itself. In systems using ATS, ACS can enable the direct routing of peer-to-peer Memory Requests whose addresses have been correctly Translated, while blocking or redirecting peer-to-peer Memory Requests whose addresses have not been Translated. AER (Advanced Error Reporting) is an optional PCI Express feature that allows for more enhanced reporting and control of errors than the basic error reporting scheme. AER errors are categorized as either correctable or uncorrectable. A correctable error is recovered by the PCI Express protocol without the need for software intervention and without any risk of data loss. An uncorrectable error can be either fatal or non-fatal. A non-fatal, uncorrectable error results in an unreliable transaction, while a fatal, uncorrectable error causes the link to become unreliable. For the needs of next generation I/O implementations, a new method to interpret the Device Number and Function Number fields within Routing IDs, Requester IDs, and Completer IDs enabled to increase the number of functions allowed per multi-function device. Allows up to 256 physical functions to be implemented in a device, instead of maximum of 8 normally. ARI (Alternative Routing Interpretation) is required for SR-IOV. ASPM L0s is a mandatory PCI Express native power management mode that allows a device to quickly suspend or resume transmission during periods of inactivity. ASPM L0s does not require any application action. It can be entered by any type of device and does not require any negotiation with the link partner. ASPM L0s is per-direction, meaning that either or both RX and TX sides can be in L0s independently. ASPM L1 is an optional PCI Express native power management mode that enables the link to be put into low-power mode with the ability to restart quickly during periods of inactivity. ASPM L1 does not require any application action. It involves negotiation between the link partners and can only be initiated by an upstream port (such as an endpoint). New FetchAdd/Swap/CAS TLPs perform multiple operations with a single requests. AtomicOps enable advanced synchronization mechanisms that are particularly useful when there are multiple producers and/or multiple consumers that need to be synchronized in a non-blocking fashion. AtomicOps also enable lock-free statistics counters, for example where a device atomically increments a counter, and host software atomically reads and clears the counter. In a virtualized environnement, ATS (Address Translation Service) allows an endpoint to communicate with root complex in order to maintain a translation cache. Endpoint can then offload root complex from time consuming address translation task, resulting in higher performances. Note that address translation cache is not implemented in core as this is very application specific. The application can direct the Core to change link speed and/or width in order to adjust link bandwidth to meet its throughput requirements. Although this is not considered a low-power feature, tuning link bandwidth can save significant power. Allows a device to reduce/increase link width and/or speed in order to adjust bandwidth and save power when less bandwidth is necessary. A PCIe Bridge provides an interface to other buses, such as PCI, PCI-X, or another bus (older or newer generation). Optional side-band pin present in some form factors, which enables power saving. It is used by the Clock Power Management and L1 PM substates with CLKREQ# features. Note that only one of these power saving techniques can be enabled at once. Techniques used to reduce power consumption when some blocks of a circuit are not in use. Clock gating enables dynamic power reduction by turning the clock off: flip-flop switching power consumption then goes to zero. Only leakage currents remain. Allows devices of same port type (2 upstream or 2 downstream ports) to train link together. At its inception, the crosslink was the only option in the PCIe specification that began to address the problem of interconnecting host domains. The crosslink is a physical layer option that works around the need for a defined upstream/downstream direction in the link training process. Cut-Through allows TLPs to be forwarded to their destination interface before they are completely stored in the Rx/Tx buffer. This enables significant latency reductions for large TLPs. as opposed to Store and Forward where TLPs must stored completely in Rx/Tx buffer before they can be forwarded to destination interface. The Data Link Layer manages communication at the link level between the two connected PCIe components in order to ensure the correct transmission of packets. Its main roles are: generation and check of the CRC and Sequence Number of the TLP, initialization and update of flow control credits, generation of ACK/NAK, and the management of the Receive and Retry Buffers. In addition, we avoid the complexity of using the existing CRS mechanism, which potentially requires polling periodically up to 1 second following reset by providing an explicit readiness indication. The DLCMSM (Data Link Control and Management State Machine) block implements the Data Link Control and Management State Machine. This state machine initializes the Data Link Layer to “dl_up” status, after having initialized Flow Control credits for Virtual Channel 0. If one or more DLLP is not acknowledged by the TxAlign and LTSTX block during a symbol time, the DLLP Encode block can change the DLLP content and its priority level to ensure that it always transmits the DLLP with the highest priority to the TxAlign and LTSTX block. The port facing toward PCIe leaf segments (Upstream port or End Point). DPA (Dynamic Power Allocation) extends existing PCIe device power management to provide active device power management substate for appropriate devices, while comprehending existing PCIe PM Capabilities including PCI-PM and Power Budgeting. An additional capability is implemented that contains advanced power allocations settings. This feature can be entirely implemented in application. DPC (Downstream Port Containment) improves PCIe error containment and allows software to recover from async removal events that are not possible with the existing PCIe specification. ECAM (Enhanced Configuration Access Mechanism) is a mechanism developed to allow PCIe to access Configuration Space. The space available per function is 4KB. ECAM enables management of multi-CPU configurations stopping multiple threads trying to access configuration space at the same time. With that mechanism, the configuration space is mapped into memory addresses. This allows a single command sequence, since one memory request in the specified address range will generate one configuration request on the bus. ECC (Error Correcting Code) is an optional mechanism implemented in some memories that can detect and/or correct some types of data errors that occurred in memory. When ECC is implemented, uncorrectable errors are reported on the RDDERR output of the transmit and receive buffers. ECC allows robust error detection and enables correction of single-bit errors on the fly. It minimizes the impact of transmission errors. ECRC (EndPoint Cyclic Redundancy Check) is an optional PCIe feature that is available when advanced error reporting (AER) is implemented. It protects the contents of a TLP from its source to its ultimate receiver. It is typically generated/checked by the transaction layer. The intented target of an ECRC is the ultimate recipient of the TLP. Checking the LCRC verifies no transmission errors accross a given link, but that gets recalculated for the packet at the egress port of a routing element. To protect against that, the ECRC is carried forward unchanged on its journey between the Requester and Completer. When the target device checks the ECRC, any error possibilities along the way have a high probability of being detected. An Endpoint is a device that resides at the bottom of the branches of the tree topology and implements a single Upstream Port toward the Root. Devices that were designed for the operation of an older bus like PCI-X but now have a PCIe interface designate themselves as "Legacy PCIe Endpoints" in a configuration register and this topology includes one. Initially PCIe allowed a device to use up to 32 tags by default, and up to 256 tags but only if this capability was enabled by the system. This engineering change was later published, now allowing PCIe devices to use 256 tags by default. External interrupt mode enables applications to send MSI / INTx messages rather than relying on the Core to do so. This can be useful, for example, if an application needs to maintain order between TLP transmission and interrupt messages. In a multi-function device, FLR (Function-Level Reset) allows a function to be reset while other functions still operate normally. When add-in cards can be added or removed during runtime. Adds a new ordering attribute in TLP headers which can optionally be set to allow relaxed ordering requirements between unrelated traffic (coming from different requesters/completers). IDO (ID-based Ordering) enables the preservation of the producer consumer programming model and helps prevent deadlocks in PCIe-based systems (potentially including bridges to PCI/PCI-X). The producer/consumer model places restrictions on re-ordering of transactions which have implications on performance, especially read-latency. Extension to AER that allows internal/application specific error to be reported. Also specifies a mechanism to store multiple headers. L1 is a legacy power state that is automatically entered by an upstream port (such as an endpoint) when its legacy power state is not D0. L1 entry does not require any action from the application; however, the application can request L1 exit. Defines three new L1.0/L1.1/L1.2 substates in order to help achieve greater power savings while in L1 or ASPM L1 state. Link partners use CLKREQ# pin to communicate and change substate. L2 is a legacy power state where the PCIe link is completely turned off and power may be removed. L2 entry must be initiated by a downstream port (such as a rootport). LCRC (Link Cyclic Redundancy Code) is a standard PCIe feature that protects the contents of a TLP across a single PCIe link. It is generated/checked in the data link layer and is not available to the transaction layer and the application. LCRC is an error detection code added to each TLP. The first step in error checking is simply to verify that this code still evaluates correctly at the receiver. Each packet is given a unique incremental Sequence Number as well. Using that Sequence Number, we can also require that TLPs must be successfully received in the same order they were sent. This simple rule makes it easy to detect missing TLPs at the Receiver's Data Link Layer. I/O bandwidth and I/O latency reduction: A device that caches data instead of transferring it over PCIe for each access can dramatically reduce I/O latency and consumed I/O bandwidth for some use models. Reducing I/O bandwidth consumption also reduces host memory bandwidth consumption. Lightweight signaling: A device using LN protocol with host memory can enable host software to signal the device by updating a cacheline instead of performing programmed I/O (PIO) operations, which often incur high software overheads and introduce synchronization and flow-control issues. Dynamic device associations: Virtual machine (VM) guest drivers communicating with a device strictly via host memory structures (with no PIOs) makes it easier for guests to be migrated, and for VM hosts to switch dynamically between using fully virtualized I/O for that device versus using direct I/O for that device. LTR (Latency Tolerance Reporting) is a mechanism that enables Endpoints to send information about their service latency requirements for Memory Reads and Writes to the Root Complex such that central platform resources (such as main memory, RC internal interconnects, snoop resources, and other resources associated with the RC) can be power managed without impacting Endpoint functionality and performance. Current platform Power Management (PM) policies guesstimate when devices are idle (e.g. using inactivity timers). Guessing wrong can cause performance issues, or even hardware failures. In the worst case, users/admins will disable PM to allow functionality at the cost of increased platform power consumption. The LTSSM (Link Training and Status State Machine) block checks and memorizes what is received on each lane, determines what should be transmitted on each lane and transitions from one state to another. Link Training and Status State Machine consists of 11 top-level states: Detect, Polling, Configuration, Recovery, L0, L0s, L1, L2, Hot Reset, Loopback and Disable. These can be grouped into five categories: Link Training states, Re-Training (Recovery) state, Software driven Power Management states, Active-State Power Management states, Other states. This ECN allows integration with M-PHY. Requires implementation of a separate physical layer (including LTSSM) for M-PHY interface. Also, a M-PHY model & BFM are necessary for verification. Enables PCI Express (PCIe®) architecture to operate over the MIPI M-PHY® physical layer technology, extending the benefits of the PCIe I/O standard to mobile devices including thin laptops, tablets and smartphones. The adaptation of PCIe protocols to operate over the M-PHY physical layer provides the Mobile industry with a low-power, scalable solution that enables interoperability and a consistent user experience across multiple devices. The layered architecture of the PCIe I/O technology facilitates the integration of the power-efficient M-PHY with its extensible protocol stack to deliver best-in-class and highly scalable I/O functionality for mobile devices. Message Signaled Interrupts (MSI) enable the PCI Express device to deliver interrupts by performing memory write transactions, instead of using the INTx message emulation mechanism. MSI-X defines a separate optional extension to basic MSI functionality. Compared to MSI, MSI-X supports a larger maximum number of vectors and independent message addresses and data for each vector, specified by a table that resides in Memory Space. However, most of the other characteristics of MSI-X are identical to those of MSI. A function is permitted to implement both MSI and MSI-X, but system software is prohibited from enabling both at the same time. If system software enables both at the same time, the result is undefined. A multi-function device is a single device that contains up to 8 PCI Express physical functions (up to 32 with ARI) which are viewed as independent devices by software. This is used to integrate several devices in the same chip, saving both chip/switch cost and power and board space. This optional feature enables devices to send/receive posted TLPs that will be distributed to multiple recipients. This enables potentially large performance gains because the transmitter does not need to transmit one copy of a TLP to each recipient. An Endpoint is a device that resides at the bottom of the branches of the tree topology and implements a single Upstream Port toward the Root. Native PCIe Endpoints are PCIe devices designed from scratch as opposed to adding a PCIe interface to old PCI device designs. Native PCIe Endpoints device are memory mapped devices (MMIO devices). A Switch is the PCIe component that allows to interconnect several PCIe devices. That is, it allows to extend the number of devices connected to the Host. PCIe Switch is transparent: all components in the PCIe hierarchy share the same address domain, defined by the (single) Host. In multiprocessor systems, each processor has its own address domain, defined during enumeration, and therefore can’t share the same address domain. - allow inter-processor communication between different Hosts. - ensure address domain isolation (by being non-transparent). Being non-transparent, by definition, implies that one Host can’t enumerate or access directly other Host PCIe hierarchy. Normal Mode with Non-Posted Buffer is similar to normal mode except that an additional buffer is implemented inside the Core that can be used to temporarily store non-posted TLPs. This enables the application to continue receiving posted and completion TLPs even when it is not ready to process non-posted TLPs. Specification that uses PCIe to provide the bandwidth needed for SSD applications. Host communicates its activity state to endpoints via messages or WAKE# pin. Endpoints have then an indication when they can freely transfer data and when they should refrain from transferring data. It helps achieve intelligent power management. Parity data protection is an optional feature that adds parity bits to data to protect it between the data link layer and the application’s logic. PASID (Process Address Space ID) is an optional feature that enables sharing of a single Endpoint device across multiple processes while providing each process a complete 64-bit virtual address space. In practice this feature adds support for a TLP prefix that contains a 20 bit address space that can be added to memory transaction TLPs. a PCIe Misc Interface to allow the Bridge to manage Low-Power, Interrupts, etc. A PCI Express switch is a device that allows expansion of PCI Express hierarchy. A switch device comprises one switch upstream, one or more switch downstream ports, and switching logic that routes TLPs between the ports. A PCI Express switch is "transparent", meaning that software and other devices do not need to be aware of its presence in the hierarchy, and also there is no driver required to operate it. In PCI Express, data transfers usually occurs only between the Root Complex and the PCI Express devices. However, peer-to-peer allows a PCI Express device to communicate with another PCI Express device in the hierarchy. In order for this to happen, Root-Ports and Switches must support peer-to-peer, which is optional. Per-vector masking is an optional feature set by the Core Variable K_PCICONF that adds Mask Bits and Pending Bits registers to MSIcapability. The Mask Bits register is programmed by the host and its value can be read by the application via the APB configuration interface, if required. Physical Functions (PFs) are full-featured PCIe functions; they are discovered, managed, and manipulated like any other PCIe device and PFs have full configuration space. It is possible to configure or control the PCIe device via the PF and in turn, the PF has the complete ability to move data in and out of the device. Each PCI Express device can have from one (1) and up to eight (8) physical PFs. Each PF is independent and is seen by software as a separate PCI Express device, which allows several devices in the same chip and makes software development easier and less costly. The Physical Layer is the lowest hierarchical layer for PCIe as shown in the figure below. TLP and DLLP packets are sent from the Data Link Layer to the Physical Layer for transmission over the link. The Physical Layer is divided into 2 languages: the logical one and the electrical one. The Logical Physical Layer contains the digital logic that prepares the packets for serial transmission on the Link and reversing that process for inbound packets. The electrical Physical Layer is the analog interface of the Physical Layer that connects to the Link and consists of differential drivers and receivers for each lane. PMUX (Protocol Multiplexing) enables multiple protocols to share a PCIe Link. It is the mechanism to enable transmission of packets other than TLP/DLLP across the PCIe link. Technique used to reduce power consumption when some blocks of a circuit are not in use. Power gating shuts off the current to prevent leakage currents. PTM (Precision Time Measurement) enables the coordination of timing. It allows the transfer of information across multiple devices with independent local timebases without relying on software to coordinate time among all devices. The Rx Buffer received TLPs and DLLPs after the start and end characters have been eliminated. The size of the Receive Bufferdepends on the allocated credits for Posted/Non-Posted/Completion Header and Data, and whether ECRC or Atomic operations are used. The Receive Interface allows user applications to receive TLPs from the PCI Express bus. Allows wider use of SSC (Spread Spectrum Clocking) clocking to ease for cabling application. It requires some changes in PHY (elastic buffer), and minimal changes in core (add some config bits and some changes in SKP OS transmission rules). This feature allows a function to report several possible sizes for its BAR instead of simply not being allocated and left out of the system or forced to report a smaller aperture in order to be allocated. 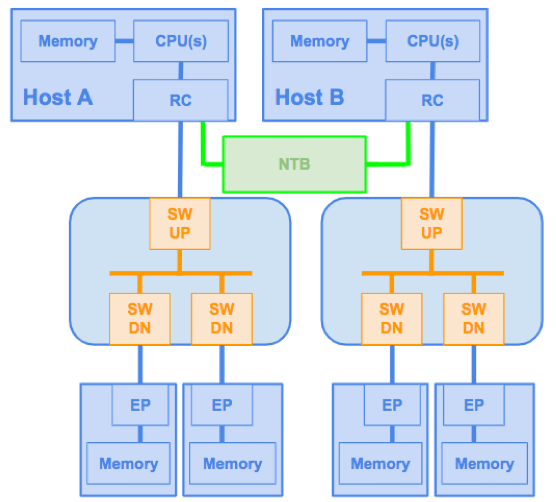 This gives the host some flexibility in case all memory spaces cannot be allocated. Retimers (extension devices) will become important in Gen4 and this feature allows PCI Express upstream devices to optionally detect their presence in order to adjust latency. Core detects a bit in training sets and set a bit in Link Status 2 register accordingly. Root Complex is not clearly defined in the PCIe spec, but can be defined as the interface between the system CPU and the PCIe topology, with PCIe Ports labeled as Root Ports in the main interface. The use of the term "complex" reflects the large variety of components that can be included in this interface (Processor interface, DRAM interface, etc...). In RX stream mode, the Core does not store received TLPs internally but outputs them to the user application immediately. This mode enables greater control on TLP ordering and processing and is particularly suitable for Bridge and Switch designs. Although it is not recommended, it may be necessary in some implementations to run TL_CLK at a frequency lower than the minimum frequency required in RX stream mode. RX stream watchdog is an optional feature that stops incoming data flow when the Receive buffer is >75% full, and resumes normal operation when the buffer is <25% full. This can avoid RX buffer overflow and, consequently, data corruption, however, this feature is not compliant with the PCIe specification. The RxLane block descrambles and decodes the received PLP and reports the type of OS (Ordered Set) received, its parameters and the number of consecutive OS to the LTSSM. The DMA source and/or destination start address is a pointer to a chained list of page descriptors. Each descriptor contains the address and size of a data block (page), as well as a pointer to the next descriptor block to enable circular buffers. Simulation mode is a special mode where some internal delays and parameters are adjusted in order to accelerate link training and to test certain features within a reasonable simulation time. The advent of the Single Root I/O Virtualization (SR-IOV) by the PCI-SIG organization provides a step forward in making it easier to implement virtualization within the PCI bus itself. SR-IOV provides additional definitions to the PCI Express (PCIe) specification to enable multiple Virtual Machines (VMs) to share PCI hardware resources. Using virtualization provides several important benefits to system designers: it makes it possible to run a large number of virtual machines per server, which reduces the need for hardware and the resultant costs of space and power required by hardware devices. It creates the ability to start or stop and add or remove servers independently, increasing flexibility and scalability. It adds the capability to run different operating systems on the same host machine, again reducing the need for discreet hardware In a virtualized environnement this feature allows functions of an endpoint to be easily & safely shared among several virtual machines. Up to 64 virtual functions per physical functions are supported. A Switch Port can be either upstream or downstream, it is always part of a switch and cannot be found in any other PCI Express device type. A switch port contains “Type 1” configuration registers. One or more DWORDs are pre-pend to TLP header in order to carry additional information for various purposes (TLP processing hints, PASID, MRIOV, vendor-specific..). TLP prefix support is optional and all devices from the requester to the completer must support this capability to be enabled. In addition, this information enables the Root Complex and Endpoint to optimize their handling of requests by identifying and separating data likely to be reused soon from bulk flows that could monopolize system resources. Providing information about expected data usage patterns allows the best use of system fabric resources such as memory, caches, and system interconnects, reducing possible limits on system performance. The Transaction Layer manages the generation of TLPs from both the Application Layer and the Configuration Space on the transmit side and checks for flow control credits before transmitting the TLPs to the Data Link Layer. On the receive side, the transaction layer extracts received TLPs from the Receive buffer, checks their format and type, and then routes them to the Configuration Space or to the Application Layer. It also manages the calculation of credits for the Receive buffer. Even though it is not part of the Transaction Layer function, this layer also includes the Configuration Space, which can receive and generate dedicated TLP. Refers to the ability of a PCI Express device to have its link width increased after initial link training. For example, a PCI Express device can initially enable only one lane so that link trains in x1, and later direct the link to Config state from Recovery and then enable 4 lanes so that links retrains in x4. The port facing toward PCIe Root. VC (Virtual Channel) is a mechanism defined by the PCI Express standard for differential bandwidth allocation. Virtual channels have dedicated physical resources (buffering, flow control management, etc.) across the hierarchy. Transactions are associated with one of the supported VCs according to their Traffic Class (TC) attribute through TC-to-VC mapping, specified in the configuration block of the PCIe device. This allows transactions with a higher priority to be mapped to a separate virtual channel, eliminating resource conflicts with low priority traffic. Virtual Functions (VFs) are ‘lightweight’ PCIe functions designed solely to move data in and out. Each VF is attached to an underlying PF and each PF can have from zero (0) to one (1) or more VFs. In addition, PFs within the same device can each have a different number of VFs. While VFs, are similar to PFs, they intentionally have a reduced configuration space because they inherit most of their settings from their PF.